We offer delivery service throughout Klang Valley and covering almost all major area In Petaling Jaya & Kuala Lumpur - Subang Jaya, USJ, Bandar Sunway, Bandar Utama, TTDI, PJ, KL, Damansara Heights, Bangsar, Mont Kiara, Sri Hartamas, Puchong, Putrajaya & Cyberjaya. We send flowers from Monday to Sunday ! Same Day delivery available when you place your order before 12pm. Order place after 12pm will be deliver on next working day from 9.30am onwards. If you place your orders after 12pm and require for same day delivery, we'd gladly try our best to assist. Please call us directly at 016-2103103, 03-56352133. For orders received one day in advance (excluding Valentines day & Mothers day ), we are pleased to accept requests for morning delivery (9.30am-1pm) or afternoon delivery (2pm-6pm). However, in some cases, delivery may not be possible within a specific time requested due to unforeseen circumstances beyond our control. For delivery on Sundays & Public Holidays, kindly place your order at least 2 Days in advance. 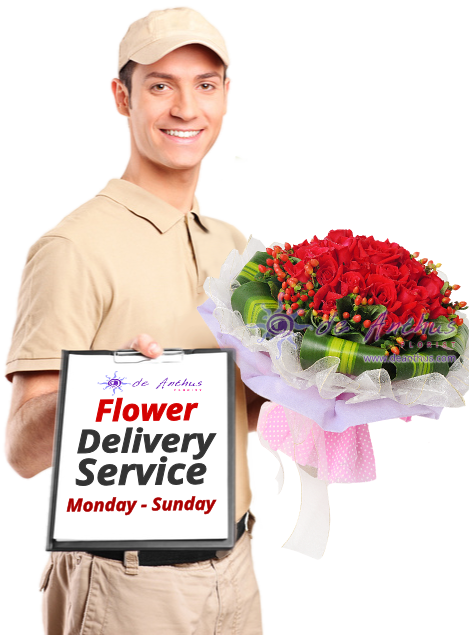 If any Urgent Order ( e.g Funeral Wreath, Condolences Flowers, Grand Opening Flowers, Congratulations Flower, Wedding Anniversary Bouquet, Birthday Bouquet, Graduation Bouquet, Housewarming Flowers, Get Well Flowers & Fruits Basket ) to be sent on Sunday or Public Holiday, kindly call us at 03-56352133, 016-2103103 to arrange for delivery. For Valentines day & Mothers day, deliveries are made on a first come first serve basis therefore it is highly recommended to place your order as early as possible to avoid any delays. Please call us at +60 3-56352133 or WhatsApp us at +60 16-2103103 for details delivery charges, areas that is not stated above.